EXPLORING THE EARTH is a regular column that examines various aspects of Earth Science through the lens of The Layered Earth software. This newsletter examines the recent massive earthquake that occurred in Ecuador and how The Layered Earth software can be used to illustrate several unique features relating to this geological event. On May 09, 2016, amateur astronomers with small telescopes and solar filters will be able to observe Mercury’s tiny silhouette moving slowly across the face of the Sun. Astronomers call this event a “transit”. Is Planet X lurking in the far reaches of the outer solar system? On January 20, 2016, Konstantin Batygin and Michael Brown announced they had strong evidence of a large hypothetical planet in the far outer Solar System. If confirmed, this object might well be the 9th Planet (or 10th if you account for Pluto) in our Solar System. Let's take a brief look at the history of planetary discovery. The five naked eye planets Mercury, Venus, Mars, Jupiter and Saturn have been known since antiquity but on March 13, 1781 British astronomer William Herschel found an object that moved against the background of the stars. At first, Herschel thought it was a comet and reported it as such. But a computation of its orbit suggested that it was a planet. And indeed, a planet it was. Over fourteen times as massive as the Earth and 4 times Earth’s diameter, it orbited the Sun beyond Saturn at a leisurely pace of 84 years per orbit. Eventually this seventh planet of the solar system was named Uranus. When this “Planet X” was in Position 1 as shown in Fig. 2, it would slow Uranus down but in position 2 it would pull Uranus ahead of its predicted position. And sure enough, on September 24, 1846 Johann Galle at Berlin Observatory found the new planetwithin a degree of its position computed by the French mathematician Urban Le Verrier. There were now 8 planets in the Solar System. The new planet, named Neptune, more massive than Uranus and almost as large, takes almost twice as long to orbit the Sun — 164 years. Figure 3 shows a portrait of Neptune taken by the Voyager 2 spacecraft in 1989 which was then 4.4 million miles from the planet. The Earth is shown for a size comparison. But all was not well. Further observations of Uranus and now Neptune suggested irregularities that could be explained by another large planet existing beyond Neptune. The hunt for Planet X was on again! A young Clyde Tombaugh was hired in 1929 by Lowell Observatory to photograph sections of the sky, imaging the same region a few days apart. Any planetary body present in the same region would shift its position against the fixed background of the stars. On February 18, 1930, Tombaugh found his planet on plates taken on January 23 and 29. Figures 4 and 5 show actual star fields on two dates in January. Images have been enhanced to clearly show the interloper and its movement in 24 hours. Tombaugh’s job was much more difficult. On his photographic plates there were many more stars and the moving image was a tiny dot. The discovery was announced on March 13, 1930 and the new planet was named Pluto on May 25. The solar system now had nine planets. Unfortunately data soon came in that the mass of Pluto was much too small to have caused the effects on Uranus and Neptune that initiated the original search. So Pluto was not Planet X after all but renewed searches for the elusive Planet X were unsuccessful. Then in 1992, using data obtained from Voyager 2, recalculations showed that there was no unexplained behaviour regarding Uranus and Neptune and hence no need for Planet X. The discovery of Pluto had turned out to be a lucky coincidence. In 1943 Kenneth Edgeworth postulated the existence of a disk of small objects left over from the formation of the solar system and located beyond the orbit of Neptune. Several years later, Gerard Kuiper proposed a similar structure. This region, now known as the Kuiper Belt, was thought to extend from the orbit of Neptune to about 55 AU from the Sun. Other astronomers agreed and in 1987 a serious search was begun by astronomers Jewitt and Luu using the University of Hawaii’s 2.2 m telescope. Five years later, in 1992, a faint object was found at a distance of 44 AU, well within the parameters of the Kuiper Belt. Catalogued as object 1992 QB1 (or QB1 for short), it was a true Kuiper Belt Object or KBO. Since 1992, over a thousand KBOs have been discovered including 2005 FY9 a hefty 1500 km object. And, of course, with an orbit stretching from about 30 to 49 AU from the Sun, Pluto is a bona fide Kuiper Belt Object. Could it be that a Planet X is somewhere out there lurking in the Kuiper Belt? In 2005 a team led by Mike Brown at Palomar Observatory discovered a massive object named 2003 UB313, at a distance of over 90 AU well outside the bounds of the traditional Kuiper Belt. In this respect it joins another of Mike Brown’s discoveries - 2003 VB12 - now known as Sedna at about the same distance. Astronomers speculate that gravitational interactions with the giant gas planets, especially Neptune, caused some objects like UB313 to be thrown into more distant orbits with higher inclinations. These objects are generally known as scattered disk objects and along with KBOs can all be lumped together as Trans-Neptunian Objects or TNOs. But back to UB313. It is just a shade smaller than Pluto but 27% more massive. Was this Planet X? No, we have already shown that there was no need for such a planet but was it indeed a planet? Was Eris, as 2003 UB313 was eventually named, the tenth planet of the solar system? What about some of the other TNOs? Just what is a planet? Pluto and Eris clearly satisfied the first two criteria but not the third. The new category of dwarf planet was created for these bodies. So neither Pluto nor Eris were planets and our solar system was back to eight planets and (as of early 2016) five dwarf planets. Does this mean the hunt for Planet X is over? No way! A Ninth Planet after all? When Sedna was discovered in 2003 its highly elliptical orbit suggested a maximum distance of almost 1000 AU from the Sun. Some astronomers suggested that this was the result of an interaction with a nearby star, perhaps even a sibling of the Sun shortly after its birth. But others thought that an equally likely explanation could be a massive trans-neptunian planet. 2012 brought the discovery of yet another of these strange objects , 2012 VP113. Its closest approach to the Sun is similar to Sedna’s and at 80 AU well beyond the Kuiper belt. Is the case for a Planet X getting stronger? Then on January 20, 2016, Batygin and Brown announced they had strong evidence of a large planet orbiting the Sun at a vast distance. Their analysis included a total of six TNOs like Sedna and 2012 VP113. All have orbits that lie approximately in the same plane and point in roughly the same direction. This arrangement has a 0.007% probability of occurring by chance but could be due to a large planet approximately 10 times as massive as the Earth orbiting the Sun every 15,000 years or so. No one has seen this planet yet but when spotted, it would once again give our solar system nine planets. Hence Batygin and Brown have named this hypothetical body Planet Nine. Ready access to interactive files that illustrate this story are available if you own Starry Night. Right/Ctrl-Click on each link and select "Save/Download Link As..." Each downloaded file can be viewed by clicking File/Open in the upper menu bar in Starry Night, and then following the path to its location. Hudson Bay, in north-eastern Canada, is one of the most prominent physical features of North America. Today it is the second largest bay in the world, after the Bay of Bengal, east of India. The physical location of Hudson Bay in North America. Sixteen thousand years ago, however, Hudson Bay lay crushed beneath an ice sheet that was 3 km (1.9 miles) thick. 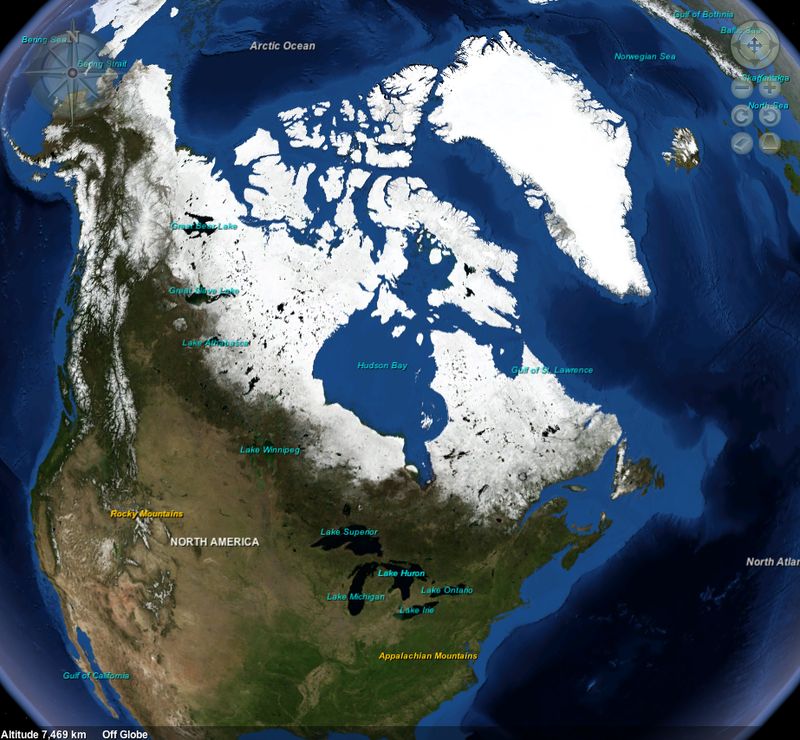 The extent of the ice sheet covering North America 16,000 years ago. Click on the Layers button in the bottom left corner of the screen. Click the radio button for 16,000 YEARS AGO. Click the Reset button in the tool bar (upper part of screen) in order to return to the default Earth view when you have finished exploring in this section. This ice sheet was so heavy that it actually depressed the Earth’s crust underneath it. 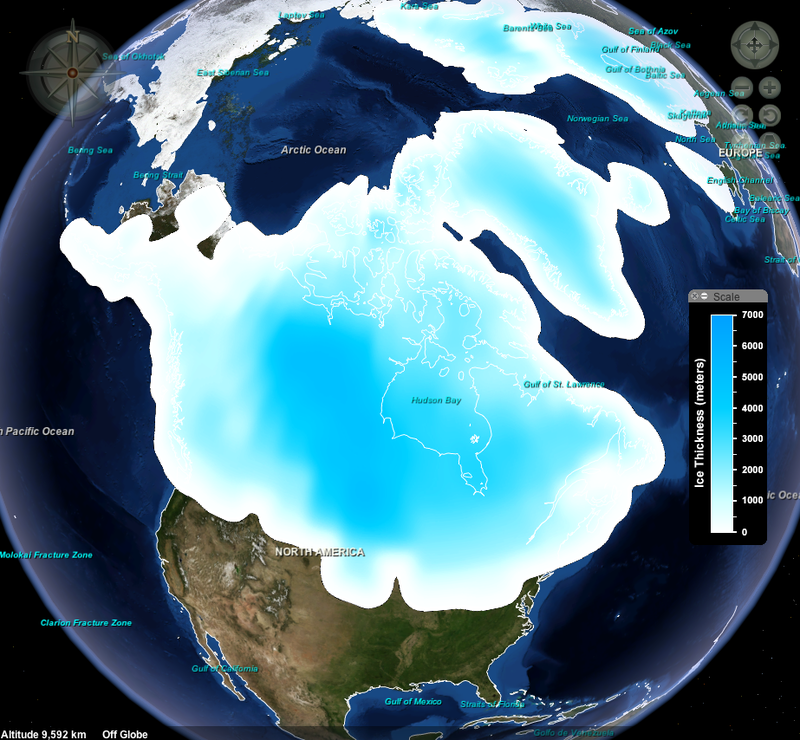 Hudson Bay only finally became free of ice sometime between 8,000 – 9,000 years ago. The removal of this immense ice burden allowed the depressed crust under Hudson Bay to slowly rebound. This rebounding continues to this day. Evidence of a depressed crust under Hudson Bay can still be seen today in gravity anomaly maps of the area. The entire Hudson Bay area still exhibits a negative gravity anomaly; this means that the measured value of g, the acceleration due to gravity, is less than it should be as a result of the depressed crust. 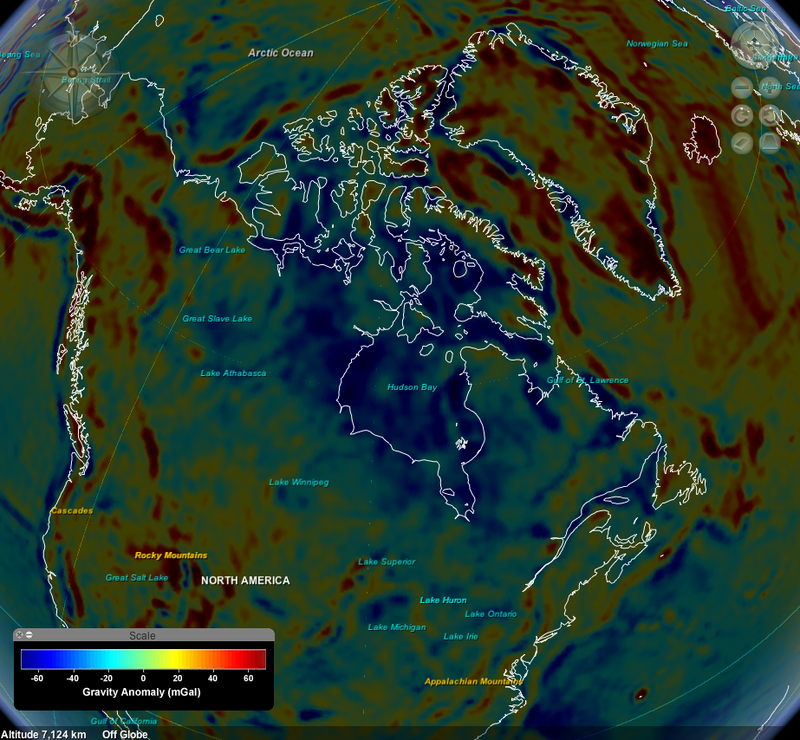 The negative gravity anomaly in the Hudson Bay area. Go to the SATELLITE IMAGERY subdirectory. Click on the checkmark in the box beside the subdirectory name. This removes the checkmark in this subdirectory and removes the satellite imagery data as active data. Click the radio button for N. Amer. States and Provinces. You should now have a clear view of the gravity anomaly data along with state/provincial outlines in North America in order to give a clearer geographical context. 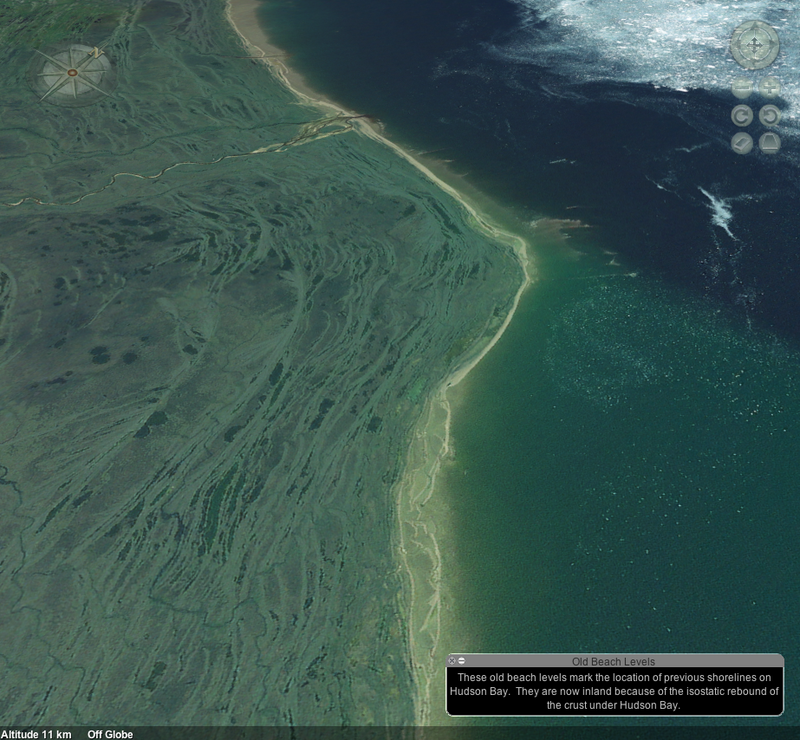 This unusual view of the Hudson Bay coastline can be found at 56.390N, 87.950W. You should now be able to see an unusual series on lines on the land surface that are parallel to the coast. What you are looking at is a series of old beach levels that mark the location of previous shorelines on Hudson Bay. They are now inland because of the isostatic rebound of the crust under Hudson Bay. Explore up and down the coast of Hudson Bay to discover other areas that nicely illustrate these previous shoreline levels. Another particularly nice example of old shorelines can be found at 58.430N, 93.100W. Ready access to all of the views and data sets that have been mentioned in this article are available if you own The Layered Earth Software. Each file (after it has been downloaded) can be viewed by clicking File/Open in the upper menu bar, and then following the path to its location. On Friday, January 8, the planet Venus will appear to pass just 5 arc minutes north of the planet Saturn, That is a mere one-sixth of the diameter of the moon, a small enough distance to fit in the eyepiece of a powerful telescope. On January 9, the planet Venus will appear to pass just north of the planet Saturn. Credit: Starry Night software. This will be a rare opportunity to see two planets at the same time in a telescope’s narrow field of view. In a lifetime of observing the skies, I have seen such a close conjunction of two planets only two or three times. With the naked eye, sharp-eyed observers will be hard pressed to separate the two points of light. Unfortunately for observers in North America, the point of closest conjunction will occur at 11 p.m. EST, while the planets are below the local horizon. For a skywatcher in New York, for example, the planets won’t clear the eastern horizon until 5 a.m. EST, at which time they will have separated so that they are 17 arc minutes apart, or slightly more than half the diameter of the moon. Even so, they will still fit in a telescope eyepiece. Of course, this conjunction is something of an optical illusion. The two planets aren’t anywhere near each other in space, but merely appear close together from our perspective here on planet Earth. Venus is currently on the far side of the Sun from Earth, 1.22 astronomical units distant (1.22 times the average distance from the Earth to the sun), so it appears similar to a gibbous moon. Saturn is 10.79 astronomical units from Earth, nearly 9 times farther away than Saturn. The two appear almost the same angular diameter: 14 arc seconds for Venus, 15 arc seconds for Saturn, yet in reality Saturn is actually almost 10 times the diameter of Venus. So Saturn’s greater distance balances out is larger size, and the two appear almost the same from Earth. The most striking difference between the two is their difference in brightness. Venus is magnitude –4.0 on the upside-down brightness scale astronomers use, while Saturn is only magnitude +0.5, 4.5 magnitudes (or almost 100 times) fainter than Venus. This difference is mainly due to Venus’ closeness to the sun (0.72 astronomical units) compared to Saturn’s (9.55 astronomical units). When you look for the twin planets just before dawn on Saturday morning, the first thing you will notice is Venus shining brightly in the southeastern sky. You will have to look closely to spot “tiny” Saturn just above and to the right of it. If you own a planetarium program like Starry Night that lets you travel to other planets, check out the view Saturday morning from Saturn. You will see Earth and Venus in a close conjunction, Venus a narrow crescent from Saturn’s perspective, and Earth a rounded gibbous shape, since despite being close in the sky, they are actually on opposite sides of the sun, and lit by it quite differently. On Monday, December 21, the Sun reaches its southernmost declination of the year, resulting in the shortest day and longest night for people in the northern hemisphere. Credit: Starry Night software. Next Tuesday or Wednesday marks a major turning point in the annual cycle of the seasons. The sun reaches its southernmost position in the sky, resulting in the shortest day of the year in the northern hemisphere, and the longest day of the year in the southern hemisphere. The solstice gets its name from the apparent stop (“stice”) in the motion of the sun (“sol”). This was carefully recorded by the earliest astronomers; monuments like Stonehenge are thought to have been used to mark the extreme positions of the sun in the sky. The December solstice has long marked the beginning of the new year, and it’s mainly because of slippage in our calendar that it now occurs eleven days before the “official” New Year, January 1. Solstice day is a day of celebration in many cultures. The Romans knew this as “Saturnalia,” and the early Christians adopted this date to mark the birth of Christ, so that they could celebrate without drawing the attention of their Roman masters. You’ll notice I said, “Tuesday or Wednesday.” That’s because, although the time of solstice is exactly the same everywhere in the world, because of our local clocks it falls on different days in different places. The exact time of solstice this year is December 22 04:48 coordinated universal time, the time used by astronomers and pilots everywhere. In England, where the prime meridian lies, the solstice will occur a 4:48 a.m. GMT on Wednesday, December 22. Similarly, it will occur in Europe and Africa in the early hours of Wednesday morning. In North America, we subtract a number of hours from UTC to get our local times. In most of eastern North America, we are on Eastern Standard Time, and subtract 5 hours, so the solstice falls at 11:48 p.m. on the previous day, Tuesday, December 21. The farther west we go in North America, the earlier the solstice occurs in the evening, so that on the Pacific coast it occurs at 8:48 p.m. PST. Remember, these are all exactly the same time in the broader scheme of things; local times are just vagaries of the way we handle time around the world. The graphic shows the sky as it would appear at the time of solstice from a location where the solstice occurs at noon, which this year would be Vietnam. Through the magic of Starry Night software, we have turned the blue sky transparent and have added the two coordinate systems we use to mark positions in the sky. The red line across the sky marks the celestial equator, half way between the celestial north and south poles. It shows 18h on the meridian because we measure right ascension, the celestial equivalent of longitude, from the vernal equinox, exactly 9 months ago. The green line marks the ecliptic, the path that the sun appears to follow across the sky. The sun is at its southernmost position, at a declination (celestial equivalent of latitude) of exactly 23 degrees and 26 minutes, which just happens to be the exact angle at which the Earth’s poles are tilted from the ecliptic. The height of the sun above the horizon on solstice day depends on your latitude on the surface of the Earth. Where I live in southern Canada, it hangs very low in the southern sky, barely 22 degrees above the horizon. For anyone north of the Arctic Circle, it never rises at all. Even in the southernmost continental United States, it’s barely 42 degrees above the horizon, less than half way up the sky. In the southern hemisphere, the situation is reversed. The December solstice marks the longest day in the year, combined with the shortest night. Longer days mean more hours of sunshine and warmer weather. You may have noticed that I have avoided using the words “winter” and “summer.” That’s because, even though the sun’s position in the sky is responsible for our seasons, it does not match exactly with the seasons as we experience them. That’s because there is a lag of about six weeks between the astronomical season markers, solstices and equinoxes, and the actual seasons. The Earth is a complex ecological system, and it takes a while for the sun’s movement to effect the temperature. Sometimes the astronomical markers are referred to as “the first day of…” which makes some sense, if the seasons were exactly 3 months long. However, the lengths of the seasons in any particular location tend to vary depending on local conditions. Hence the old joke about the Canadian seasons: eleven months of winter and one month of bad sledding. Never stop improving! Starry Night 7.4.1 update is now live! More than a year and a half into the release of Starry Night 7 we are still working furiously to bring fresh improvements and features to Starry Night. Developers see software the same way that artists see their creations - always in need of improvement. - Added a preference to support drawing selection labels as plain text (as in V6), instead of textured tags. - Added Drag-Drop support for dropping SNFs onto the Starry Night sky to open. - (Enthusiast) Added "Night Vision" mode. - Added back Ambient Audio. - Exported Observing Lists now include J2000 positions. - Remembers your last open/save folder locations and defaults to these on File > Open/Save. - Fixed Custom horizon images and editing. - Fixed date formatting display (OSX). - Fixed Meteor Shower radiant drawing. (Was too dim on OSX). - Fixed movie creation of very large movies (OSX). - Fixed trackpad click and drags (OSX). - Fixed Constellation search results. The best part of making software is knowing that the changes you make affect so many people who use your creation regularly. The improvements made to satisfy your need for perfection benefit many! So fire up your Starry Night 7 and tell us what you think about the latest changes! On Monday, December 7, The moon will occult Venus, as seen from most of North America. This event takes place in daylight, but both the moon and Venus will be visible in the daytime sky. The exact time depends on your location. Credit: Starry Night software. Next Monday, December 7, the planet Venus will do a vanishing act behind the moon. In the course of its monthly journey around Earth, the moon often passes in front of stars, and occasionally planets. Next Monday it will pass in front of the brightest of them all, the planet Venus, in what is called a lunar occultation. This will be visible, weather permitting, all over North America. The only catch is that it occurs in broad daylight. I’m often surprised that many people don’t know that the moon is visible in the daytime sky; in fact my son first spotted it when he was about 2 years old. That mainly says that very few people bother to look closely at the sky. On Monday, the moon will be a slender crescent only a few days away from new moon, so may be a bit harder to spot, though if you start observing at dawn you should have no trouble following it up into the blue sky. Venus is also visible in daylight provided you know exactly where to look. On Monday, its closeness to the moon will help you spot it. The time the occultation will occur depends on your exact location. For example, in New York City, Venus will disappear behind the moon at 12:43 p.m. EST and reappear at 1:51 pm. In Chicago the occultation lasts from 11:20 a.m. CST until 12:35 p.m. In Los Angeles, the times are 8:06 and 9:56 a.m. PST. The easiest way to get the exact times for your location is with a planetarium program like Starry Night or SkySafari. It was observations of occultations by the moon of stars and planets that first told us that the moon has no significant atmosphere. Stars simply wink out and in as they pass behind the moon; planets show no fuzziness as they disappear behind the moon’s edge. Starry Night gives you the opportunity to travel to other places in the universe, and view events from a different perspective. Our second image today shows the view of this occultation from the planet Venus at 12:35 p.m. EST. Instead of an occultation, we see what is called a transit, as one object (the moon) passes in front of another (Earth). The moon is moving from right to left in this view. Seen from Venus, the moon will transit Earth, blocking the view of most of North America. If the moon looks strange here, it’s because we’re looking at its far side, the side never seen from Earth. Credit: Starry Night software. The occultation is already over on the east coast, to the right of the Moon, and has yet to begin on the west coast, to its left. The surface of the moon looks strange because we are seeing its “far side,” the side permanently turned away from Earth. This side has more mountains and craters and fewer open flat plains than the side we usually see. The first quarter moon is riding high in the western sky in the early evening this week, a perfect time to explore its surface with binoculars or a small telescope. Credit: Starry Night software. One of the first things every new moon watcher learns is that, when observing the moon, timing is everything. You might think that the best time to look at the moon with binoculars or a small telescope is when the moon is full, because it looks so big and bright. Well, that’s usually the worst time of the month for observing the moon. That’s because at full moon, the sun is high overhead on the moon’s surface, making it look like the desert at high noon. Far better times are at first and last quarters, when the sun is shining obliquely across the moon’s terrain, casting mountains and craters into high relief. That’s what makes this week the perfect time to begin your exploration of our nearest neighbor in space. First quarter will be on Thursday night, November 19, meaning that the moon is one quarter of the way around the Earth in its monthly journey. The light will be hitting the terminator, the boundary between light and shadow, very obliquely, making the moon exactly half illuminated. Because the moon is a world in its own right almost as large as the planet Mercury, and because it is so close to us, its surface geography is know almost as well as that of the Earth. Its surface has been mapped for hundreds of years, and most of its features have been named. Everyone who studies the moon soon becomes familiar with its major features and their names. What catches everyone’s attention first at this phase of the moon is the three gigantic craters almost exactly in the centre of the moon. Like almost all the craters on the moon, these are named for famous astronomers of antiquity. The northernmost and largest of the three is Ptolemaeus, named for Claudius Ptolemy. His name was given pride of place on the moon because he was probably the greatest astronomer of antiquity. His book, the Almagest, was written in the middle of the second century AD, and summarized all of astronomical knowledge of his time. It was written in Greek, but is known by its Arabic title because it only survived into the modern day in an Arabic translation. The crater Ptolemaeus is 95 miles (153 km) in diameter, and is characterized by a wide flat floor pockmarked by many small craterlets. The middle crater of these three is Alphonsus, named for Alphonso El Sabio, king of Castile in what is now Spain in the 13th century. Besides being a king, he was also an astronomer and a musician, and compiled the Alphonsine tables which were used to calculate planetary positions until the time of Kepler. This crater is a bit smaller than Ptolemaeus, but is more of a typical lunar crater with a central peak and complex system of rilles on its floor. This crater became famous in the 1950s when a Russian astronomer claimed to have seen a volcanic emission in it. The third crater Arzachel is smaller still, 60 miles (97 km) in diameter, but with a larger central peak. Just to the north of these three craters is the broad arc of the Apennine mountain range. This range is 370 miles (600 km) long and has peaks as high as 16,000 feet (5,000 m) in height. At its northern end is Mount Hadley, near which the astronauts of Apollo 15 landed in July 1971. To the west of the Apennines is the broad expanse of the Mare Imbrium, the so-called “Sea of Rains.” Early astronomers had no idea how dry and airless the moon was, and its “seas” are dryer than the driest deserts on Earth. This is the second largest “mare” on the moon, exceeded only by the Oceanus Procellarum to its south. The Mare Imbrium is a huge flat plain 720 miles (1160 km) across, with an area of 320,000 square miles (830,000 sq km). It contains many small mountain massifs and individual peaks. The lunar Alps are to its north, enclosing the beautiful crater Plato, 63 miles (101 km) in diameter. Its almost flat floor contains a number of small craterlets which are used by lunar astronomers to test the resolution of their telescopes. How many can you see? Near the south pole of the moon, look for the gigantic crater Clavius, 140 miles (225 km) in diameter, and containing a whole series of craters in its interior graded in size. The largest of these is large enough to warrant a name of its own, Rutherford, 32 miles (51 km) in diameter. With these landmarks learned, you can begin your exploration of the moon’s finer details. What I like to do myself is to start at the moon’s north pole and work my way down towards the southern highlands along the terminator, using a good lunar map to identify the topography. Most of the features I’ve described can be seen with ordinary binoculars. Even the smallest telescope will reveal hundreds of smaller features. The moon is generally a good target for photography, because it is so bright that long exposures are not needed. You can even put your smartphone up to the eyepiece of your telescope and get remarkably good photos that way. The autumn sky shows the transition from the summer Milky Way, through the “watery” constellations of autumn, to the bright stars of winter. Credit: Starry Night software. Autumn is the favorite season for many skywatchers. You can get your last look at summer stars and, if you stay up late, your first look at winter stars. Best of all, it gets dark earlier and the night temperatures are still comfortable. Our graphic this week shows a panorama of the sky looking south around 8 p.m., just after the sky becomes fully dark. After the change to standard time this weekend, this will be the view at around 7 p.m. Looking towards the west, at the right in the graphic, you can see the familiar constellations of summer. Sagittarius and the core of the Milky Way Galaxy are setting in the southwest, while the summer triangle: Deneb, Vega, and Altair, shines overhead. It’s not too late to revisit some of the popular summer objects: double stars Albireo and Epsilon Lyrae, the globular clusters in Hercules and Ophiuchus, the Ring Nebula in Lyra, and the bright nebulae and clusters of Sagittarius. Looking south, the upside down triangle of Capricornus rides high. Its rightmost star, Algedi, is a naked-eye double. Above Capricornus, just to the left of Altair, is the tiny constellation Delphinus, the dolphin, one of the few constellations that actually looks like its name. It’s worth exploring the region between Altair and Albireo, where you will find two of the finest deep sky objects: Brocchi’s Cluster, popularly called “the coat hanger,” and the Dumbbell Nebula, one of the largest and brightest planetary nebulae. Many of the constellations in the autumn sky have watery associations. These include Capricornus (the sea goat), Delphinus (the dolphin), Aquarius (the water bearer), Pisces (the fish, plural), Piscis Australis (the southern fish, singular), and Cetus (the whale). Most of these are lacking in bright stars, with the exception of Pisces Australis which contains the first magnitude star Fomalhaut, the first star to have one of its planets directly imaged by the Hubble Space Telescope. Although Aquarius is dim in terms of stars, it contains a number of fine deep sky objects, including the globular cluster Messier 2, and two fine planetary nebulae, the small bright Saturn Nebula snd the huge Helix Nebula. The latter is probably the planetary nebula closest to the sun, about 700 light years distant, and as a result is very large in size, almost as large as the moon. Because of its large angular size, its light is spread out over a wide area, making it very hard to see. You will need a narrow band filter on your telescope to spot it. Off to the east, the Square of Pegasus dominates the sky. This consists of three stars in Pegasus with the fourth corner of the square being marked by Alpheratz, the brightest star in the constellation Andromeda, which trails away to the northeast. Right in the upper left corner of the graphic are the two largest and brightest galaxies in our neighborhood, the Andromeda Galaxy and the Triangulum Galaxy. These are located symmetrically on either side of the second pair of stars eastward from Alpheratz in Andromeda. The Andromeda Galaxy (to the north) is large and bright. If you live in a city, you will need binoculars to see it, but sharp-eyed observers in the country, including myself, have spotted it with their unaided eyes. The Triangulum Galaxy is almost as large, but nowhere near as bright as Andromeda. It is best seen in small binoculars. Oddly, it is very hard to see in the narrow field of a telescope because its dim light is spread across such a large area. Stay up until midnight, and you will see him, too. On Monday morning, October 26, Venus will be at its greatest elongation from the sun, and will also appear close to Jupiter. Credit: Starry Night software. On Monday morning, October 26, Venus will be at its greatest elongation west, the farthest it can get from the sun as seen from Earth. Venus has been dominating the morning sky for the last two months, and reaches its greatest angular separation from the sun on the 26th: 46 degrees west of the sun. Remember, directions in the sky are the reverse of directions on the surface of the Earth because we are looking outward rather than inward, so west is to the right in the sky if you live in the northern hemisphere. The inner planets, Mercury and Venus, never stray far from the sun in Earth’s sky. Mercury was at greatest elongation west, 18 degrees from the sun, last Friday, October 16, and is now moving back towards the sun. Venus is still moving away from the sun, but will pause and reverse directions on the 26th. Mars and Jupiter, with orbits outside that of Earth, both appear to be moving steadily westward relative to the sun. As a result, Venus and Jupiter will pass very close to each other on the 26th, within 1.1 degrees. Venus is by far the brightest of the two, at magnitude –4.6, while Jupiter is nearly 3 magnitudes fainter at magnitude –1.8. Mars, which is also nearby in the sky, comes a distant third in brightness at magnitude +1.7, more than 3 magnitudes fainter than Jupiter and 6 magnitudes fainter than Venus. This close conjunction of Venus, Jupiter, and Mars is best observed with the naked eye or binoculars. In a telescope, Venus will appear as a perfect miniature quarter moon, because at greatest elongation it is lit by the sun exactly from its left side. It is 24 arc seconds in diameter, slightly smaller than Jupiter at 33 arc seconds, but much larger than Mars at 4 arc seconds. Venus appears brightest because it is both close to the sun and close to Earth. Jupiter is much larger in actual diameter, but is far from the sun so only lit dimly. Mars, in between in distance from the sun and small in size, is currently very far from Earth, so appears even dimmer. To put them in perspective, even though grouped close together in our sky, the three planets are at vastly different distances. Venus is closest at 0.69 astronomical units, Mars next at 2.2 a.u., and Jupiter farthest at 6.0 a.u., nearly ten times farther than Venus. An astronomical unit is the average distance between Earth and the sun. Many photographers have been taking advantage of the close approach of these three planets to photograph them in the dawn sky, though the different brightnesses present a challenge in exposure. As always, we welcome your pictures of this beautiful event. Uranus is easy to spot with binoculars in the constellation Pisces. Credit: Starry Night software. Sometimes a whole bunch of different sky events happen over a very short period, giving skywatchers a chance to witness many unusual events in a few days. The next week or two is a case in point. Look at the chart above, and you will see how to spot Uranus using an easy bit of star hopping. Start with visualizing an equilateral triangle with one side marked by Hamal in Aries and Algenib, the lower left star of the square of Pegasus. The third point of the triangle is Alrescha, Alpha Piscium. The stars that make up this chain do not have names, only Greek letters. Starting at Alrescha, they are Nu, Mu, Zeta, and Epsilon. You don’t need to know their names, just look for Uranus between the last two, a bit to the south of the line joining them. Planetary diameters are usually measured in arc seconds: the number of seconds they subtend at the observer’s eye. There are 360 degrees in a circle, 60 minutes in a degree, and 60 seconds in a minute. To give you some idea how tiny the planets appear, the sun and moon are both around 30 arc minutes in diameter, or 1800 arc seconds. The largest any planet can appear to Earthbound astronomers is Venus at its closest, which is about 1 arc minute or 60 arc seconds in diameter. Thus all the planets are typically smaller in a telescope than the largest craters on the moon. On Thursday, October 15, Mercury will be at the farthest it strays west of the sun. Because it is only 18 degrees away from the sun, it can best be seen about half an hour before sunrise. Again it is easiest to spot in binoculars. It is about twice the angular diameter of Uranus, so will look like a tiny half moon 8 arc seconds across in a large telescope. On Sunday morning, October 18, Mars will be in conjunction with Jupiter, and the two planets will be close enough together that both will fit in the same field of a small telescope. Look for Mars just above Jupiter. Both will be on the far side of the Sun, so much smaller than they usually appear when in the evening sky. Jupiter measures 32 arc seconds while Mars is only 4.1 arc seconds, half the size of Mercury. By the time they reach opposition in spring of 2016, they will swell to 44 and 18.3 arc seconds respectively. Again on Sunday morning, October 18, the shadow of the moon Io will chase the shadow of Ganymede across Jupiter’s face. Both shadows will be on Jupiter from 6:42 to 8:08 a.m. EDT, but will be increasingly hard to see after sunrise at around 7:30 a.m. local time. Observers in western parts of North America will have a better view because the transits will occur between 3:42 and 5:08 a.m. PDT, long before sunrise, though Jupiter will be lower in the sky. Exactly a week later. on Sunday October 25, there will be another double shadow transit. This one is especially interesting because both shadows enter the disk at almost the same time, 8:36 a.m. EDT or 5:36 a.m. PDT, but then cross at very different speeds, Io’s shadow taking 2 hours and 17 minutes to cross while Ganymede’s takes 3 and a half hours, because of its greater distance from Jupiter and larger orbit diameter. This transit occurs in full daylight in eastern North America, so probably won’t be visible, but is at a much more favorable time for western observers. The next two weeks are an excellent opportunity to spot the brightest of the asteroids, Vesta. In the first six years of the 19th century, astronomers discovered four new members of the solar system. All four were small objects moving in orbits between the orbits of Mars and Jupiter. Initially they were called planets, but by mid century, enough new objects had been found in this area that they were given a category of their own, much as Pluto was reclassified from a planet to a dwarf planet. They were called “asteroids” because all were so small that they looked just like stars in the telescopes of the day. Now there are tens of thousands of known asteroids. Vesta is the brightest of all the asteroids, ranging between magnitudes 5 and 8, and one of the largest, measuring 318 miles (512 km) across. It reached 6th magnitude at opposition on September 29, meaning that it could just barely be seen by someone with perfect eyesight at a perfectly dark site. The rest of us have to make do with binoculars. Here’s how to find it. A wide angle view of the autumn constellations, showing the position of the asteroid Vesta in Cetus. Credit: Starry Night software. The first chart shows its overall position among the constellations of autumn. The two left-hand stars of the Square of Pegasus, Alpheratz and Algenib, point southward across the circlet of Pisces to the constellation Cetus, the Whale. Look for a large triangle formed by Eta and Iota Ceti and Deneb Kaitos. The last is easy to spot because, although only second magnitude, it is by far the brightest star in this rather dim part of the sky. Eta and Iota are both magnitude 3.5, so quite a lot dimmer than Deneb Kaitos. A close up of the westernmost stars of Cetus, showing the position of the asteroid Vesta over the next two weeks. Credit: Starry Night software.